leaves can be chopped into water to make lemonade-like drink. 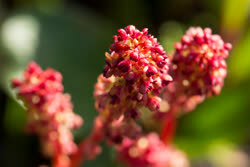 plants were traditionally boiled with berries and/or salmon roe and poured into thin cakes. grows in moist, open areas in montaine, subalpine and apine regions. warning: eat raw plant in moderation due to oxalates, which interfere with nutrient absorption. This plant was an important food source for Inuit because it is high in Vitamin C. The leaves were, and still are, eaten raw or sometimes preserved in seal fat. If you are out on a hike and there is no fresh water, you can eat some leaves to quench your thirst! 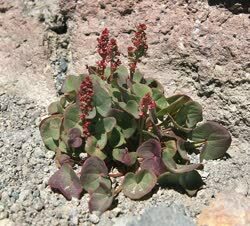 Mountain sorrel was also used medicinally in a brew to help people with low energy. Or, if too much fat was consumed, a sorrel brew could be used to ease stomach aches. The sorrel with a greener colour are sweeter than the reddish coloured ones. When you rub a bunch together with your palms they get very sour and sweet to chew. We didn�t have access to sweets; we�d eat sweet sorrel instead. We also used to boil them and make a sweet drink. Once they were boiled, the water turned green and when you took a sip, it tasted very sweet.